Published: Jan. 20, 2014 at 06:36 a.m. 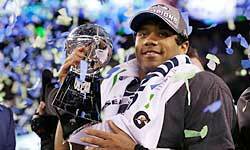 Updated: Jan. 22, 2014 at 03:48 p.m.
SEATTLE -- He was brash. He was defiant. He was mouthy. He was combative. And Richard Sherman was absolutely sure he would have the last word, because that's the way the dude is wired, his legions of denigrators be damned. This was on Friday night in Sherman's living room, as he and a pair of family members were attempting to relax in advance of Sunday's NFC Championship Game at CenturyLink Field -- and failing miserably. Gaming console in hand, the Seattle Seahawks' All-Pro cornerback was battling his cousin, James Raby, in "Call Of Duty" while jawing with his older brother, Branton, about the upcoming clash with the San Francisco 49ers. Specifically, Richard was riled up about Branton's insistence that the Seahawks' defense would bear the bulk of the burden in unseating the defending NFC champs and sending Seattle to its second Super Bowl. "It was hot," Richard recalled Sunday night after making the pivotal play of an epic game -- call it the Seattle Swat -- to preserve the Seahawks' 23-17 victory and set 68,454 fans ablaze like Hendrix torching his guitar at Monterey Pop. "I mean, it was scorching. It was two brothers, going at it like brothers do, and neither one was backing down." It was a recollection that, conveniently, also served as an apt description for the third and most memorable meeting between fierce NFC West rivals who might well be the two best teams in football. And while the Denver Broncos, who'll face the Seahawks in Super Bowl XLVIII in East Rutherford, N.J., on Feb. 2, might have something to say about that, the Battle of Seattle undeniably lived up to its billing. In the end, Sherman and the Seahawks made a massive statement about their grit, resilience and penchant for clutch play. Afterward, his mouth became a story, as Sherman spit verbal fire at 49ers wideout Michael Crabtree, inciting a real-time social-media riot of grotesque proportions. We'll get to that, just as we'll explain what led the Sherman brothers to get in one another's grill two nights earlier, but first we have to break down the thrilling climax of an NFC title game that featured pro football in its finest incarnation. It happened as the Seahawks, having battled back from deficits of 10-0 and 17-10, teetered on the verge of losing a contest they seemed to have seized control of during a ferocious fourth quarter. After Steven Hauschka's 47-yard field goal gave Seattle a six-point lead with 3:37 remaining, the Niners took over at their own 22 and proceeded to drive 60 yards on eight plays against the NFL's No. 1 defense. Suddenly, with 30 seconds left, San Francisco was 18 yards from the end zone, and from completing a thrilling comeback that would have served as a 21st Century counterpart to The Catch. As stressful as the situation was, the men responsible for saving the Seahawks' season put a positive spin on the situation. "We were ecstatic," insisted strong safety Kam Chancellor, who locked down Niners tight end Vernon Davis all game and had a key fourth-quarter interception. "We know the ball's gonna be in the air, and it's an opportunity, and we couldn't wait. We said, 'Let's get this ball.' "
Tested only once all day by 49ers quarterback Colin Kaepernick, who threw for 153 yards and ran for 130 more, Sherman was determined to get his. And when he saw Crabtree -- who, Sherman would later tell NFL Media, earned his enmity after slighting him at an offseason charity function hosted by Arizona Cardinals receiver Larry Fitzgerald -- as a potential target with the season on the line, he wanted nothing more than for Kaepernick to come his way. "Then I got pushed and couldn't get it with two hands. I had a moment of (thinking), Damn, I'm not gonna get the pick. But then I got a hand on it." Sherman's hand essentially tilted the conference's axis of power 800 miles up the Pacific coastline and propelled the Seahawks 3,000 miles east to Jersey -- an impending trip for which they probably believe a plane will not be required. The 'Hawks are flying high because, when Kaepernick let it fly, he messed with the wrong guy. Said Chancellor: "Ringworm Sherm always gets it done." As usual, Sherman's defensive teammates had something to do with that. Kaepernick sent the ball Crabtree's way in the face of pressure from defensive end Cliff Avril, who 10 game minutes earlier had forced a turnover deep in Niners territory by dislodging the ball from the quarterback on a sack. "I put some pressure on him and I looked back to the end zone," Avril said. "I saw Sherm flick it up, and everything just stopped. It took forever and a day, man." With the ball descending toward Crabtree at the right sideline, about halfway between the goal line and back line of the end zone, Sherman leaped and flicked it upward with his left hand. Falling backward, Crabtree watched helplessly as the ball hung there a few feet in front of him while Seattle outside linebacker Malcolm Smith -- perhaps the most anonymous starter in this game -- closed in and cradled it while facing the thwarted receiver. Sherman, on the back end of a 360-degree spin, got a nice view of the game-clinching interception, too. "I know how our defense is," Sherman said. "We fly around. Somebody's gonna make a play. I thought Earl (Thomas) might get there. Then (Smith) did." It was the last big play in a game chock-full of them, beginning on the first snap. With the CenturyLink crowd still revved up by Heart singer Ann Wilson's blistering national anthem, the Seahawks took the ball at their own 20 after a touchback -- and Niners outside linebacker Aldon Smith promptly took it away, sacking Seattle quarterback Russell Wilson and falling on the bobbled leather orb at the 'Hawks' 15. A pair of forceful tackles by middle linebacker Bobby Wagner helped the Seahawks hold the Niners to Phil Dawson's 25-yard field goal, but San Francisco's defense was equally stout. And when Kaepernick (three plays after a Sherman hold on Crabtree extended a 49ers drive early in the second quarter) broke containment, burst into the secondary and raced 58 yards past a slew of flailing defenders, Seattle had a collective case of heartburn, and San Francisco had a first-and-goal. Three plays later, Anthony Dixon's 1-yard dive would make it 10-0 with 10:03 left in the first half. At that point, the pregame argument between the Sherman brothers -- what Branton described as "Friday Night Fights" -- took on added significance. It had been Branton's contention that "if Russell Wilson gets you even close to 200 yards, it might not be the best game, but a decent game, that'll be enough. It's gonna come down to the defense. And if you guys are good enough, you're gonna win the game." By Branton's recollection, Richard retorted: "It can't be just us! Our quarterback has to step up to the challenge. Our offense has to step up. It's about the team!" As he has so many times in his short and luminous career, Wilson (16-for-25, 215 yards, one touchdown, no interceptions) fought through some shaky stretches and gave his team a spark. With eight minutes left in the second quarter, he showcased two of his special talents, smartly scrambling in the pocket to keep a play alive and, as he approached the line of scrimmage, launching a gorgeous deep ball to receiver Doug Baldwin, who had gotten behind the defense. The 51-yard completion set up Hauschka's 32-yard field goal, and the Seahawks would go into halftime trailing by only a touchdown. Five minutes into the third quarter, Seattle tied it at 10 -- running back Marshawn Lynch (22 carries, 109 yards) came through with another Beast Mode beauty, rambling 40 yards for the score. At that point, CenturyLink was louder than a Soundgarden set at the Crocodile Café back in the day. "That created an electricity, not only on offense, but the defense kicked it up a notch, and special teams started balling," Seahawks fullback Michael Robinson said of Lynch's run. "He is the face of the franchise, and his running style epitomizes what our team is all about." The two teams would then trade eerily similar touchdowns, with a Hauschka field goal sandwiched in between. Kaepernick put the Niners up 17-10 on a sick, oh no he didn't, 26-yard jump pass (really) that traveled just over the outstretched arm of All-Pro safety Thomas (who may have gotten a finger on it) and was snatched by receiver Anquan Boldin in the back of the end zone. Naturally, Wilson answered in equally spectacular fashion: When Aldon Smith jumped offside on a fourth-and-7 play from the San Francisco 35, the ultra-cool quarterback, knowing he had a free play, launched a glorious pass that receiver Jermaine Kearse managed to catch while being tightly covered by cornerback Carlos Rogers. That put the Seahawks up 20-17 with 13:44 remaining -- and it was time for the defense to close things out. Yet despite forcing turnovers on consecutive possessions (Avril's strip-sack of Kaepernick, and Chancellor's interception of a sideline pass for Boldin) in Niners territory, Seattle would come away with only a field goal, leaving the 49ers in striking range at game's end. "You knew it would come down to defense," Wagner said. "You've got two great defenses on the field, so one of them was going to decide it. We wanted this challenge." And after he and his teammates stepped up to the challenge, Sherman was determined to tell Crabtree -- and the world -- all about it. As the rest of the Seahawks were celebrating Malcolm Smith's game-clinching interception, Sherman got in Crabtree's face, picking up a taunting penalty in the process. Then he cranked up the trash talk for the cameras, referencing the receiver in numerous interviews and using words like mediocre and sorry. Later, Sherman explained that he was angered by something Crabtree had said to him while the two were socializing with other players (including then-49ers receiver Kyle Williams, now with the Kansas City Chiefs) at a function associated with Fitzgerald's charity softball game in Scottsdale, Ariz., last April. Sherman wouldn't share specifics, saying only that "(Crabtree) said something to me, and I told him I'd make him pay for it on the field." While Sherman's seemingly over-the-top response will be debated, hated and oversaturated in the lead-up to Super Sunday, those who fixate on that side of his persona are missing a good game. He might be polarizing, but this intelligent young man is not a cartoon character, and he does have a compassionate side. Told that Bowman had suffered a torn ACL, Sherman shook his head repeatedly and groaned, "Aaaaaaaaaah nooooooo. No, man, no, no. Damn! He's such a great player. He's come into his own, and I hope he recovers and comes all the way back. He has to." Sherman's growing legion of detractors, which by now includes virtually everyone in Northern California, likely won't be moved by such empathetic displays as they quarrel with the popular narrative -- which is about to be stoked by two weeks' worth of massive media attention. Yet as the Seahawks try to win their first championship, it's hard to imagine them pulling it off without Sherman's brash, defiant, mouthy and combative side contributing heavily to the cause. "Man, off camera, he's a very humble dude," Wagner said, gesturing toward Sherman a few lockers away. "He's down to earth. He just gets into that mode when the lights come on, and it's a lot to deal with. It's great. We feed off of it." Hand to mouth, Sherman provided plenty of nourishment for his teammates and his critics on Sunday, and there's no sign that he plans to back down anytime soon. Love him or loathe him, he had the last word on this day, and that word was Super. 1) Seattle Seahawks: Yo, Dr. Dre, were you not entertained -- and what is it about this stadium and surreal moments? 2) Denver Broncos: So, um, what was that y'all were saying about Peyton Manning face-planting in big games?